Permethrin (C21H20Cl2O3) is both a medication and insecticide. As a medication it is used to treat scabies and lice. A local pharmaceutical company communicated with us with the request to analyze an impurity compound in Permethrin active pharmaceutical ingredient that failed to be analyzed by standard GC-MS or by any other means including LC-MS. The analysis target was to identify an unknown impurity that eluted at about 1.7 times the retention time of Permethrin in GC-FID chromatogram and to provide its molecular ion and structural information. Additional target was to attempt to get elemental formula for this impurity. As shown below, Permethrin was successfully analyzed by GC-MS with Cold EI, and its impurity was clearly identified with molecular weight of m/z=536.3 and its elemental formula was assigned as C33H44O6. This information plus additional Cold EI fragmentation pattern information and the known synthesis reactants and its possible pathways were used by the synthetic chemist to get the structure of the impurity. This important impurity structure information helped to remove or largely reduce the concentration of this drug impurity. In contrast, we also tried to analyze this Permethrin impurity by GC-MS with standard EI and failed. Consequently, we are interested to learn and explore why GC-MS with standard EI failed in this analysis and particularly which performance aspects of GC-MS with standard EI are deteriorated with the sample size and by how much they deteriorate for the analysis to fail. GC-MS with Cold EI: The Aviv Analytical 5975-SMB GC-MS with Cold EI system was employed, based on the combination of an Agilent 7890A-5975 GC-MSD with the Aviv Analytical supersonic molecular beam interface and its fly-through ion source. GC-MS with standard EI: Agilent 7890B-5977B GC-MS with its inert ion source. Samples: Permethrin active pharmaceutical ingredient (API) diluted to about 0.2% in hexane to form light yellow solutions. Column: For Cold EI it was Agilent DB1HT of 15 m, 0.32 mm ID, 0.1 µm film. For standard EI it was 30 m, 0.25 mm I.D. with 0.25 µm DB5MS-UI film. He column flow rate: 12 ml/min in Cold EI and 1.2 ml/min in standard EI. Oven: For Cold EI it started at 50ºC initial temperature and ramped at 30ºC/min to 320ºC and held until 12 min. For standard EI it started at 50ºC initial temperature and ramped at 10ºC/min to 320ºC and held there for 10 min. Mass spectral range and scan speed: m/z 50-800 at about 2 Hz scan frequency. Figure 1. 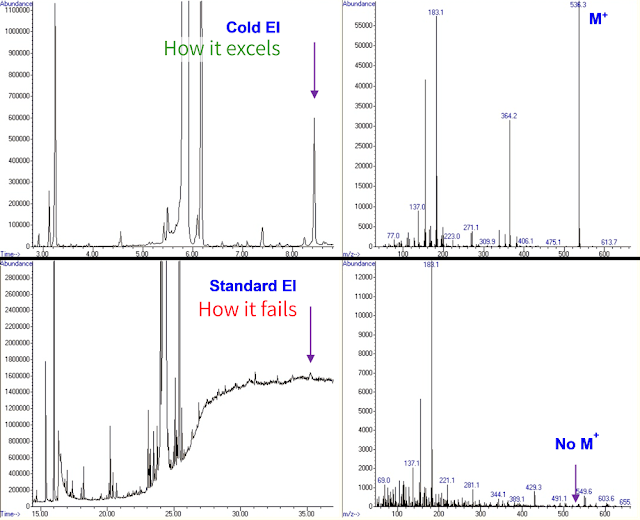 GC-MS with Cold EI total ion mass chromatograms of Permethrin and its impurity (upper left) versus GC-MS with standard EI (bottom left) and Cold EI mass spectrum of the Permethrin impurity that eluted at 8.43 min (upper right) versus the standard EI mass spectrum (background subtracted) of that Permethrin impurity that eluted at 35.25 min (bottom right). The searched impurity exhibited a molecular ion with m/z=536.3. This is unambiguous molecular ion identification as the molecular ion is a dominant ion and all higher mass ions intensities were negligible. The impurity was at about 1.5% abundance, in agreement with GC-FID data. Permethrin itself has two isomers at about 1:3 ratio and 38% relative Cold EI abundance of its molecular ion. Another abundant Permethrin impurity was Permethrin with the addition of HCl thus MW=426 and another major impurity was m-Phenoxybenzyl alcohol which has a structure like a degradation product i.e. portion of Permethrin. Elution: In Cold EI the impurity eluted and was easy to locate and analyze while in standard EI with its standard method it did not elute and we had to prolong the standard waiting time at 320ºC from 5 min to 10 min in order to elute it. General impurity recognition: In standard EI it was impossible to recognize the impurity unless based on information that was provided by Cold EI via the use of RSIM at m/z=183, while in Cold EI it was easy to locate it as shown. This is due to a combination of TIC signal that became weaker with mass and noise that increased with mass as well as absence of the impurity molecular ion in standard EI. Molecular ion: In Cold EI it was dominant as m/z=536.3 while in standard EI its intensity was zero and unobserved while high mass baseline noise could be misleading. This is a fundamental qualitative difference in favor of Cold EI. As compounds become larger in terms of their number of atoms, the molecular ions internal thermal energy is increased (more than linearly with the number of atoms) and thus, as known, the molecular ions abundance is reduced with mass in standard EI while it is high and about size independent in Cold EI. Other molecular ions: In Cold EI Permethrin (the API itself) exhibited 38% molecular ion relative abundance versus 0.8% in standard EI and similarly for the impurity of Permethrin with added HCl Cold EI mass spectrum exhibited 32% molecular ion abundance versus 0.9% in standard EI, thus the Cold EI molecular ion gain over standard EI was a factor of 40-50. High mass fragment ions: In Cold EI we clearly observed the m/z=364.2 fragment ion that was relatively very weak in standard EI and buried in the noise (3% relative abundance in standard EI versus 50% in Cold EI). This ion was important for final structural elucidation and confirmation of the correct elemental formula. Possibly, it was weak in standard EI due to partial intra-ion-source degradation. Elemental formula: The TAMI software provided the correct elemental formula C33H44O6 as number 3 in its table, and it was supported by the fragmentation pattern and synthesis information thus was selected. Standard EI could not be used to provide any elemental formula since it requires having a molecular ion that was absent. Speed: Cold EI analysis was about 4 times faster. Response uniformity: Cold EI exhibited uniform response in similarity to GC-FID while standard EI did not. Thus, Cold EI enabled the elucidation of the approximate impurity concentration (1.5%) without the use of compound specific calibration. In contrast, as the sample compounds become bigger standard EI intra-ion-source peak tailing (and degradation) gradually erodes the EI response uniformity until it is completely missing as demonstrated for the Permethrin impurity. Relative signal gain: In comparison with standard EI the impurity exhibited relative signal gain of 200 in Cold EI versus early eluting impurities and 100 relative to the major impurity of Permethrin which is Permethrin hydrochloride. This is a quantitative manifestation of the Cold EI response uniformity and its absence in standard EI for high mass compounds. Signal to noise ratio: The impurity total ion count (TIC) signal to noise ratio in peak to peak was 300 in Cold EI versus 2.7 in standard EI thus a gain factor of over 100 for Cold EI. In addition, it means that Cold EI uniquely complies with the need of S/N>10 for 0.1% active pharmaceutical ingredient (API) impurities. Total ion count (TIC) signal to baseline ratio gain: Cold EI was better than standard EI by the staggering factor of 1600 as Cold EI is superior to standard EI in both higher signal and lower baseline noise. Signal to noise ratio on the molecular ion: In Cold EI reconstructed single ion monitoring (RSIM) on the molecular ion m/z=536.4 we obtained high signal and zero noise with only few scattered ions as noise. Even if we shall assume single ion noise of 20 counts the S/N would be higher than 5000 (in peak to peak) while in standard EI no signal was obtained and only noise was observed. Thus, we concluded a staggering Cold EI gain in signal to noise ratio on the molecular ion of >10,000. The analysis of higher mass impurities: In Cold EI we could analyze far bigger impurities than the one with m/z=536.3 while in standard EI the analysis ended at about the elution of the impurity. In addition, we also found an additional impurity with m/z-548.2 (45% relative molecular ion abundance) that definitely contains 4 chlorine atoms, that eluted in Cold EI at 7.40 min and with 0.26% concentration. This impurity was fully missing in GC-MS with standard EI. In Figure 2 we show our own illustration description of the average total ion count and molecular ion intensity dependence on the sample compound mass for standard EI and for Cold EI. While this information is generally known to most GC-MS users we are not familiar with any literature discussion of it. Figure 2. The “harder” the sample compound analysis the greater is the Cold EI gain in sensitivity and identification capabilities. The illustration diagram demonstrates our perception of the average sensitivity and identification gain of GC-MS with Cold EI versus sample mass as well as the average decline in signal and molecular ion signal with the sample compound mass with GC-MS with standard EI. The ratio of the red to the purple curves of standard EI shows the average decline in the molecular ion relative abundance versus mass. The purple arrow indicates the m/z=536.3 mass of the Permethrin impurity compound that is discussed in this note. Total ion count (TIC) signal decline with mass: Sample compounds experience about 50-100 internal scattering (adsorption-desorption) cycles at the standard EI ion source. As the sample size is increased its volatility is reduced and the sample compound adsorption time at the ion source metallic surfaces is exponentially increased thereby creating the known ion source peak tailing. As known, a small peak tail behaves like an iceberg and hides significant signal loss. Ion source tailing increases the chromatographic peak width but only once it exceeds a few seconds it starts to reduce the peak areas and thus above a certain sample compound size the effect becomes significant and the TIC signal is reduced exponentially with size above such critical sample size. The user can reduce the peak tailing via the increase of the ion source temperature but such ion source temperature increase exponentially reduces the molecular ion abundance via its increased molecular ion internal thermal energy plus the magnitude of intra-ion-source sample degradation is also largely increased with the ion source temperature. Accordingly, for GC-MS with standard EI the TIC signal is reduced with the sample compound mass on the average as shown in Figure 2 purple curve. The signal reduction is typically smaller for non-polar compounds and larger for polar compounds. Note that from Figure 2 we predict TIC signal reduction factor of 50 for the Permethrin impurity, which is close enough to our measurements considering the fact that elution at the end of the analysis constant temperature zone also induces some peak broadening hence further TIC signal reduction. In contrast, Cold EI with its contact-free fly-through ion source does not suffer from any ion source peak tailing or degradation thus follows the relatively flat blue curve shown in Figure 2. Baseline noise increase with mass: As the sample compound size is increased its elution temperature becomes higher and eventually it elutes at the end of analysis mass chromatogram thermal plateau on top of the column bleed and ghost peaks noise from earlier analyses. Such analysis at the end of the mass chromatogram further induces peak broadening that reduces the ratio of TIC signal to baseline noise ratio. Accordingly, as observed the Permethrin impurity analysis experienced increased and high baseline noise. In contrast, in Cold EI vacuum background MS noise is eliminated in its fly-through ion source while the use of high column flow rate results in significantly lower elution temperatures that can be before the onset of column bleed as demonstrated in Figure 1. Thus, the noise level in Cold EI is far lower than in standard EI and consequently the Cold EI RSIM on m/z=536.3 molecular ion of the impurity resulted in zero ions noise. Molecular ion relative abundance: As the sample size is increased it is known that the relative abundance of molecular ions is reduced. The main reason for this phenomenon is that the sample compounds thermal heat capacity depends on the number of vibrational levels, which linearly relates to the number of atoms which typically relates to the molecular weight. Thus, as the sample molecule size is increased its intra-molecular-ion thermal energy is increased and this internal vibrational energy is more than linearly increased with mass if the ion source temperature is increased to reduced peak tailing. Such thermal energy increase initially induces greater molecular ion fragmentation until a certain point in which the thermal energy is so large that practically all the molecular ions are fragmented. In addition, bigger sample compounds tend to be more thermally labile thus they tend to decompose at the catalytic metallic surfaces of the ion source. In contrast, in Cold EI the sample compounds are vibrationally cooled in their supersonic expansion and thus have practically no internal vibrational energy regardless their size (hence the name Cold EI). Thus, Cold EI is known to be characterized by enhanced and abundant molecular ions for all compounds and the bigger the sample compound the greater is its molecular ion abundance. In addition, Cold EI is inherently immune against any ion source degradation in view of its contact-free fly-through ion source structure. Standard EI was useless for the analysis of the explored Permethrin impurity while Cold EI was useful for this analysis. As the sample molecule size is increased its standard EI TIC signal is reduced while the baseline noise is increased and the molecular ion relative abundance is exponentially reduced until one reaches failed analysis. While for Octafluoronaphthalene and other similarly easy to analyze compounds (by GC-MS) the signal to noise ratio can be a few thousands for one pg in RSIM on the molecular ion, for the Permethrin impurity it was well below 1 for 3 ng thus demonstrating about seven orders of magnitude sensitivity decline for large and harder to analyze sample compounds. In contrast, in GC-MS with Cold EI the various performance aspects are about sample size independent up to about doubled size compounds versus GC-MS with standard EI. Consequently, GC-MS with Cold EI significantly extends the range of compounds and applications amenable for GC-MS analysis and thus can increase its total use and market.